Gluten-Free Milan! 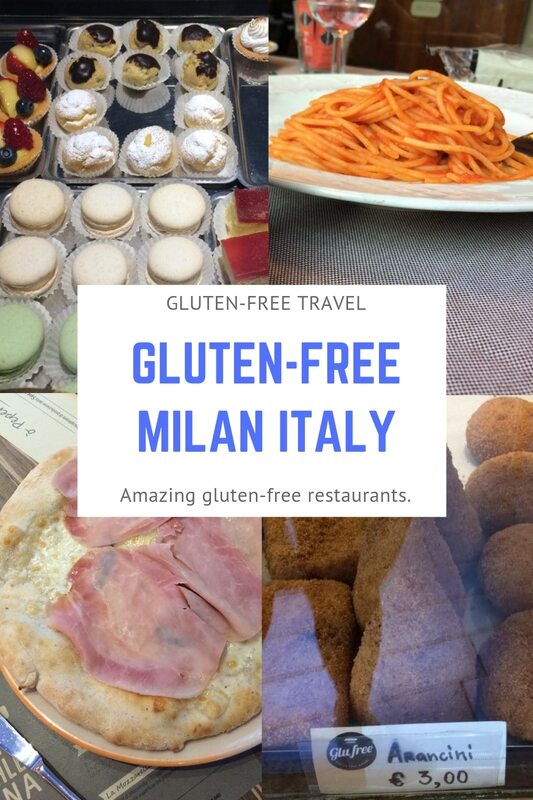 My family of four visited Milan, Italy and we had a fabulous time and ate incredible gluten-free food at some of the best gluten-free Milan restaurants. I’ve heard several people say they can’t travel because they are celiac, or intolerant to gluten and are afraid of getting sick. Please don’t be afraid. Be adventurous. Travel. I’ll be honest with you, it does take a little bit of planning, but any trip does. You can do it! We stayed at the Best Western Atlantic Hotel. I found them by searching through hotels on Tripadvisor. I specifically look for hotels that can accommodate my family of four (which is hard to find in Europe), includes free WIFI, air conditioning, and the hotel gets bonus points of it has free breakfast. Why would I care about free breakfast? Europe, especially countries like Italy, Switzerland, and Germany have phenomenal breakfast buffets. Most buffets have gluten-free products either separate or prepackaged. If you don’t see something you can eat, just ask, most staff members will accommodate you. When we checked into the hotel, I forgot to let them know that we needed gluten-free items at breakfast. The next morning, we loaded our plates up with fruit, cheese, cured meats, and hard-boiled eggs (still in the shells). My oldest daughter was wearing a shirt that said, “Gluten is not my friend.” A staff member came over and asked about it. We let them know that we were gluten-free. The next day they had fresh baked gluten-free croissants waiting for us. I was a little skeptical and tested them with my Nima Sensor (gluten testing device). They were gluten-free and we were in heaven. Next time you stay in a hotel, let the hotel know in advance that you are gluten-free and ask if they can accommodate you. Before we left for Milan I simply Googled, “Gluten-Free Bakeries Milan”. The internet can do wonders for you if you know what to search for. Several popped up, including two that we visited. We visited Pan Per Me first. They are a dedicated gluten-free bakery. We hopped on the Metro (local train service that is inexpensive) and headed over. The bakery was on a bustling little side street just south of the center of Milan. They had everything from meals, like sandwiches and salads, to intricate cookies and tastefully decorated baked goods. We picked up a couple of mini pizzas, some croissants, and little cakes and macaroons. Everything we had exceeded my expectations. We couldn’t tell that anything was gluten-free and everything was priced so reasonably. Cookies and cakes were $1-$2, and our pizza was less than $3. Croissants were less than $2. GluFree gluten-free bakery has two locations. We chose the one closest to us, which was near Pan Per Me. The bakery was on the smaller side, but it was PACKED with customers. When we made our way to the front we were pleasantly surprised to find quiche, pizza, and ARANCINI. The arancini was HUGE and so cheap. My hubby and I opted for the arancini, and our girls went for the chocolate fill croissants. The arancini were as big as my hand, and perfectly cooked. Pure heaven. We didn’t find any dedicated gluten-free restaurants in Milan, but we did discover that most restaurants serve gluten-free pasta, even if not listed on the menu – just simply ask. You might worry about cross contamination, but Italy understands what it means to be gluten-intolerant or celiac. So much that they stock gluten-free foods in grocery stores and pharmacies. The Italian government provides celiac individuals with gluten-free foods and/or a stipend to purchase gluten-free foods. And something that amazes me is that the gluten-free foods in Italy cost the SAME as the glutinous foods. We tried gluten-free pasta at several restaurants, and tested the dishes for gluten using our Nima Sensor, before eating. We are gluten-intolerant and none of us got sick. We found a few restaurants that served gluten-free pizza, but La Pizza Tradizionale was our favorite. It was large, and had the best crust of any of the other gluten-free pizza’s we tried. We brought Canyon Bakehouse bread and bagels with us for breakfast and for picnicking. While we like to eat breakfast at the hotel, and dinners out, we like making our own lunches and taking them with us while we site see. We made sandwiches, bagel sandwiches, and ate bagels when we were in a pinch for time and couldn’t eat breakfast at the hotel. One of the many things that I love about Canyon Bakehouse products is that they stay fresh for a long time. We ate our way through two loaves of Heritage Bread and two bags of bagels over two weeks. After that we used the remaining break to make French toast one morning in our apartment in Bellagio. Even after all that time, the bread was still fresh and tasted amazing. Check with your credit card and bank on rates before you leave. Most of the time, you pay less withdrawing money at the ATM, and ATMs are on every corner. This is true for almost anywhere you travel overseas. Trains are inexpensive and quick. Most cities in Italy have a train system. Use buses and trains to get around. All restaurants charge a service fee or cover charge. The fee is per person and varies from restaurant to restaurant. Most restaurants won’t serve tap water, even though it’s safe to drink. They serve bottled water “with gas” or “natural” and charge ridiculous prices. In some cases, it’s cheaper to drink a glass of wine. There are fountains all around Milan. The water is fresh, cool, and clean. Bring a water bottle with you and fill it up often. Grocery stores carry gluten-free foods, prepackaged salads, and cold drinks. If you are looking for a quick meal, bring a bag with you (otherwise you must ask for one and they charge), and stock up. We ate salads several days for lunch. If you can’t find gluten-free foods in the local grocery store, hop into a pharmacy. Most people speak some English. Have you been to Milan? What was your favorite restaurant or bakery? I hope you travel to Italy and like it as much as we do! I love travel posts like this! Did you happen to spy any dairy-free friendly stuff while you were there? 🙂 That sandwich looks amazing, too! So unbelievable that it’s gluten free. Is that their heritage bread in the pic? I’m so glad! Check out the other pages in my travel places too.